One of the chief arguments for Reagan's fiscal policy of trickle-down economics was "money was all appropriated for the top in hopes that it would trickle down to the needy." Essentially that by providing tax cuts and write-offs to wealthy individuals and corporations the rest of the population will become more prosperous. This policy comes from the belief that the government is wasting economic resources and by returning that tax revenue to wealthy entities it could be put to better economic use. And thus the policy would create more jobs and raise the standard of living for all Americans. It's been decades since Reagan's administration, so it maybe possible for economists to objectively answer whether or not the trickle-down policies have worked as described. So does economic data support or not support whether this theory was correct or incorrect? High rates of corporate taxation reduce corporate investment and thereby depress local wages. Using cross-country data I estimate that a ten percentage point increase in the corporate tax rate of high-income countries reduces mean annual gross wages by seven percent. The results do not support the common belief that the burden of corporate tax falls most heavily on skilled labor; corporate taxation appears to reduce the wages of low-skill and high-skill workers to the same degree. The incidence of the corporate tax in the form of reduced wages suggests that taxing labor instead of taxing corporations could be Pareto-improving. By Pareto-improving she means "a change to a different allocation that makes at least one individual better off without making any other individual worse. "1 In other words, she concludes that taxing labor instead of corporations might make some individuals better off and have no negative consequences for the rest. Stephen Gordon, professor of economics at Université Laval, has a long reading list of studies on the subject available here if you're interested in reading more on the subject. 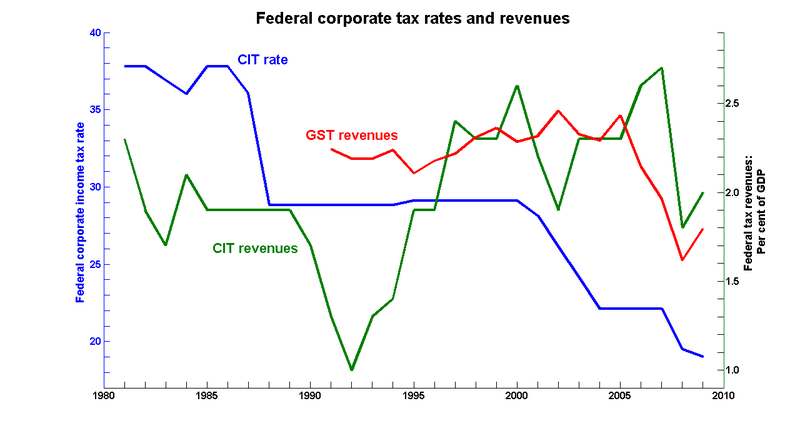 Even though the corporate income tax rates have been reduced by half, the revenues (as percentage of GDP) have remained relatively steady, rising or falling with the economy. If CIT revenues were proportional to CIT rate, there would be a drastic fall in revenues over the decades. That didn't happen. The other taxes (consumption, property, and personal income) seem to much less disruptive. As such, cutting them won't result in voodoo economics the same way cutting corporate income taxes would. The size of the government does not appear to matter much. What is important is the “quality of government” (governments that produce hyperinflations, distortions in foreign exchange markets, extreme deficits, inefficient bureaucracies, etc., are governments that are detrimental to an economy). In other words, it's a bad idea to let politicians like Robert Mugabe have control over a large part of your country's GDP, but many countries such as Sweden and Norway are wealthy countries, in spite of having a large public sector, because of competent economic policies. There's a large body of literature on what consists the best "tax mix." The results of the analysis suggest that income taxes are generally associated with lower economic growth than taxes on consumption and property. ... Property taxes, and particularly recurrent taxes on immovable property, seem to be the most growth-friendly, followed by consumption taxes and then by personal income taxes. Corporate income taxes appear to have the most negative effect on GDP per capita. These findings suggest that a revenue-neutral growth-oriented tax reform would be to shift part of the revenue base towards recurrent property and consumption taxes and away from income taxes, especially corporate taxes. The decision to lower personal income tax was economically sound. I will not weigh in on whether 28% is unnecessarily low, but 70% was undeniably too high. Lowering taxes does not increase tax revenue but, if the tax causes enough distortion, lowering the tax can cause only a minor reduction in revenue. As such, the claims of supply-siders that lowering taxes was overblown, but they were not entirely wrong either. A smaller government is better only if the politicians are untrustworthy. While some taxes are bad for the economy, that fact cannot be used to argue for a small government. Large government can be effective, as Nordic countries so well demonstrates. What matters is having the right tax mix to sustain your government. Not the answer you're looking for? Browse other questions tagged economics politics taxes .